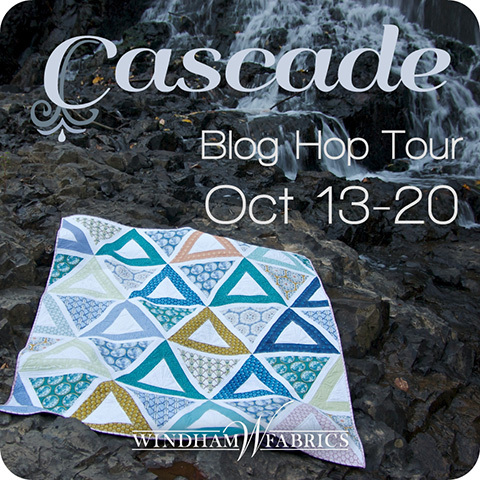 Today is my stop on the Cascade fabric collection blog tour and I'm so excited to share this collection with you! My friend Jessica Levitt, the fabric designer, is beyond creative. She can make Pinterest jealous with her crafty talents and parties. So when she asked me to be a part of her blog tour, I had to say 'Yes!'. 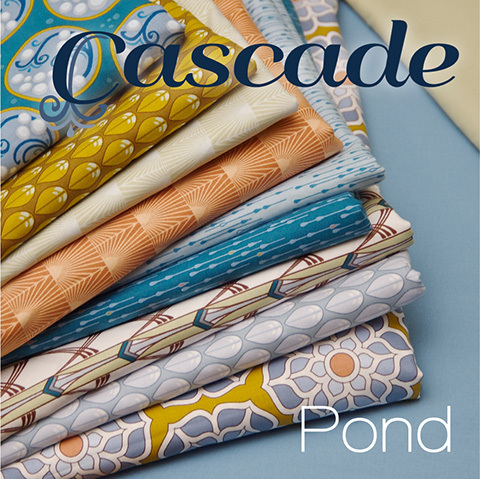 Cascade comes in two well-named colorways, Pond and Glacier. Jenn Nevitt of knit 'n lit made this soothing Chopsticks quilt in Cascade. Chopsticks is always great for featuring full and charming prints. Jenn also made a Seaside table runner featuring Cascade. And she made a Rock Candy table topper in Cascade. And you can see more of Cascade here, too. 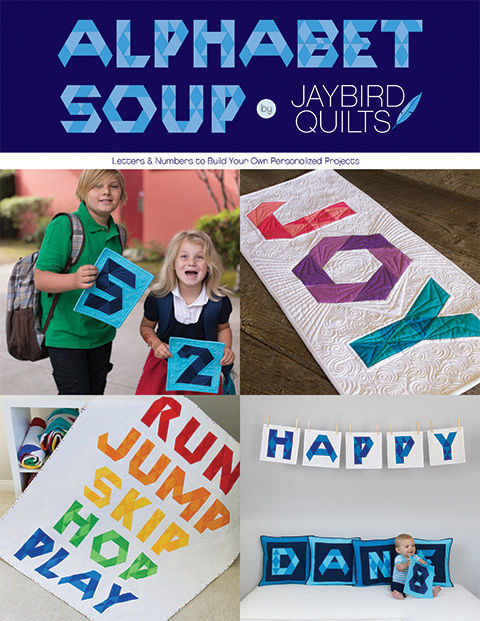 Windham Fabrics offering a fat quarter bundle of Cascade to one lucky Jaybird Quilts reader! 2. In your comment tell us about a project you're inspired to make with Cascade fabric. You have till 9PM PST on Tuesday, October 21st to enter. Good luck! The giveaway is now closed. A winner will be announced soon. Thanks so much to everyone who entered! 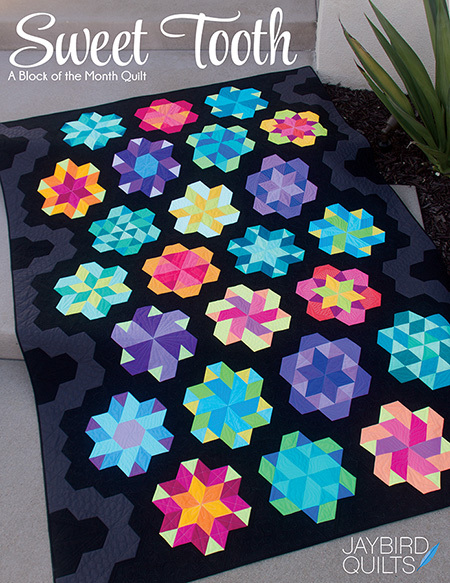 I really love that chopsticks quilt -- I want to make one exactly like it now! Love this fabric and Disco and Seaside runner are my go to patterns. I think this fabric would look so nice with the new stereo pattern! I love the Chopsticks quilt! That is one of your patterns I haven't made yet. But I also think that Night Sky would be really nice in these colours. Lovely fabrics and beautiful eye candy! Thanks for the chance! I would love to make this in OhFranssons Sparkle Punch quilt! The Cascade fabric is gorgeous, love the delicate blues! I would like to make a lap quilt to cuddle under during the dark winter nights that are to come. The design is to be decided, but Chopsticks looks nice! 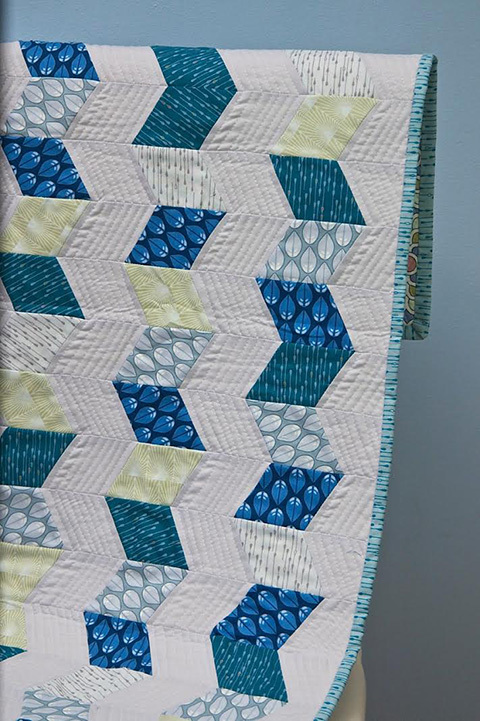 I have a group of blues and greens that I once made a "water" quilt with. These fabrics would go great with those fabrics for another similar quilt. I would love to make a beautiful wall hanging with the Cascade fabrics. A beautiful wonky log cabin for our log cabin in the Cascade Mountains in Oregon. Those fabrics would make a great star in a star pattern. Very pretty! Thanks for the opportunity. Night sky would be awesome with this fabric! Thanks for the chance to win some! Chopsticks using Cascade is glorious! That's what I'd make. 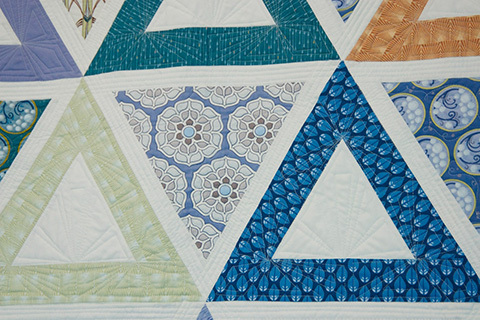 The Chopstick quilt is beautiful in Cascade. I would make that one. I would love to make the Seaside table runner with Cascade. It's just beautiful! BEAUTIFUL ASSORTMENT. I would likely make some big totes for the women in my family. I love the idea of a picnic quilt in these colors! a chevron runner would be fun with these beautiful fabrics! Cascade is gorgeous! I think Chopsticks would be my pattern of choice...great inspiration!! I am thinking I'd make some cute zippered pouches for teachers and friends! Thanks for the giveaway! I think I'd like to do a really long table runner for the length of my table. Ha, Chopsticks was on the short list of quilt patterns my boyfriend just asked me to make him a few days ago, love that version. Wow! What gorgeous fabrics! I think I see a seaside quilt made with this! Beautiful! I would love to make the Seaside runner. I am working on Toes in the Sand in one assortment of fabric - but would love to make it again with this! i would make a quilt for my grand daughter. I've had the Tiny Dancer pattern for awhile now, and this stunning line would be perfect for that quilt! Wow! Those fabrics are beautiful! 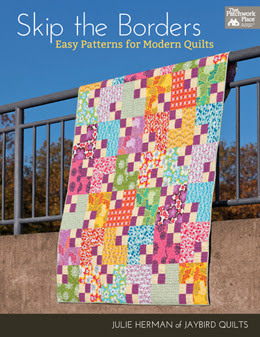 And I'm really loving that Chopsticks quilt- I think I might have to give that a try! Thanks for the giveaway! The fabric inspired me, a scrappy quilt. I really like the how Chopsticks shows off the fabrics, so I'd probably go with that! Chopsticks is a great pattern for both this fabric line and many more. What a gorgeous line! I'd love to make a throw quilt for the couch. Such inspiring projects! 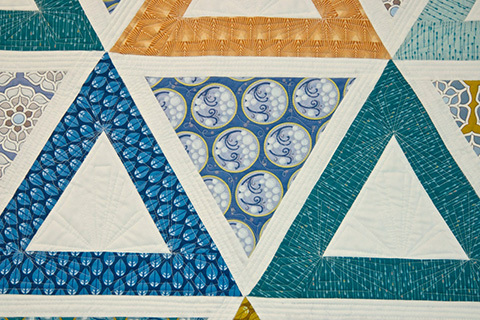 Well, after seeing that beautiful Chopsticks quilt in that beautiful Cascade fabric...I want one! Great backdrop for quilt photos! HI, I love the table topper you made>I'd like to make one like it! Thanks for sharing! I would like to make some cushions, our sofa needs some jazzing up. This would go beautifully in my sons room!! The Geared for Guys book has one pattern (I think its urban decay?) That would look great with this!! I would love to make that table runner for myself and to make a lap quilt to give as a Christmas gift. I would love to make a quilt using the Lotus pattern that I have. Would love to make some totes with this fabric line! Something that represents mountains. This fabric is wonderful. I agree, these prints need a pattern that can show off their boldness. I really like how they look in Chopsticks, actually. I bet they would look great in an all triangles patchwork as well. I love this fabric and would like to have it to pull from when I do blocks for the Nuture Circle of Do Good Stitches. I would use the glacier colors to make a quilt for my bed. Love the colors!!! I think these fabrics would look amazing in the Indian Blanket from Stitched in Color. Such a great color palette. I am inspired to make a quilt to use on the pontoon using Cascade! I have the Chopsticks pattern. Maybe this is the fabric that it is calling for. Stunning fabrics! and perfect for a table topper and matching wall hanging for my dining room! Thanks for the opportunity! Gorgeous fabrics. I love the colors. I would make a lap quilt to brighten up my living room. I love the Chopsticks quilt! These colors would be fantastic for helping me finish the Ocean Waves quilt I've been working on forever! This fabric would be perfect for the baby quilt I'm working on! Thanks!! This fabric is beautiful!! I love how you quilted your first pictured quilt. This fabric would be perfect to make a quilt for my daughter. She'd love the colors and the non-traditional prints. The Zen Bubble is a beautiful quilt. Lovely in its simplicity. A definite must try. Thank you for the giveaway. I love the quilting and piecing! The colors are so beautiful!! I would love to make a quilt for my daughter who is off at college. She is in CA and the colors would be perfect! I can relate. I lived the first half of my life in the Pacific Cascade area. Our area's yearly festival was called the Cascade Water Follies. I have a lot childhood memories. I would make a quilt for my sister. Thanks. g fahrion at comcast dot net. 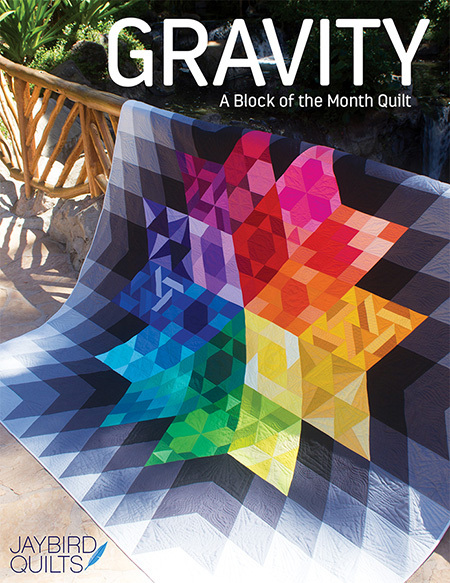 A quilt for my brother has been on my list -- this would be great for him. I would definitely make the chop sticks quilt. These would be beautiful in a lap quilt for next summer to take to the lake. The Cascade fabric collection is beautiful and Jessica did an awesome job. I love the quilt! wow beautiful fabric, i would love to make a beautiful quilt for my mom, just not sure what pattern yet i would make from it. I can see a new set of dinner napkins from this fabric series. Some of my current napkins are getting a bit weary - time for a new set! Love this fabric line and I have fallen in love with the Chopstick pattern so that is what I would make. How lovely -- great patterns, great colors. I would love to win Cascade. Not sure what pattern, but I would make a lap quilt and take with me on my next trip to Mt. Shasta. I have made Chopsticks before but it sure looks good in this fabric. Disco would be another good choice. Adore these new fabric packs. Beautiful. They will really make a quilt outstanding with the beautiful colors. Beautiful fabric. Not sure what I would make but have had the ocean on my mind since our last trip there. This fabric would work well. Thanks for the give away! That's a very beautiful fabric line!! I didn't use my Chopsticks pattern yet and I'd love to make it in the Cascade Glacier version! Rock Candy also looks great in this collection! 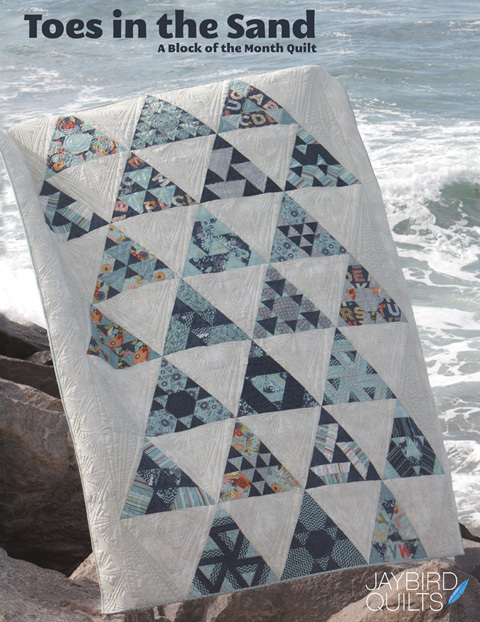 Loved the Diamond Strands quilt made up in this fabric so I think I'd try that. Thanks! I would love to make a quilt with that fabric - and the chopsticks quilt looks wonderful! 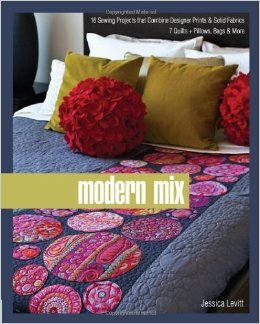 I'd make the Chopsticks quilt - love the colors of these two collections! Ooo I love the seaside table runner. That quilt has been on my wish list for some time and I just love it in the Cascade fabric line. Gorgeous! I love the way that Chopsticks quilt looks. I would love to make that! I would definitely make a quilt for my sister. This fabric would look great in her house. I might even have to make a Chopsticks quilt too! I would make a chandelier quilt I saw. It would be so peaceful in this fabric! I would make a lovely quilt that shows off the beautiful patterns in the different fabric. Your patterns look great in this fabric! Hard to chose which one to make. Maybe I would make the Chopsticks quilt and use a dark contrast instead of light, or maybe I'd make your Delight quilt. I would love to make chopsticks quilt with these fabrics. Matsche.christine@yahoo.com. I LIKE TO MAKE QUILTED BUN BASKET LINERS...FUN TO DO AND TO JUST TRY A PATTERN BLOCK I LIKE. I love that table runner! I would sew up a couple for holiday gifts. Thanks. I've been looking for a print to showcase in a stack and whack star quilt for my grandson. Glacier would suit it to a tee. And I'd have to make a seaside table runner for me! I love Glacier and Pond. Science fair would be awesome but so would ballerina. Yum! oh my gosh I'd make it all, purses, totes, mini quilts, runners, table toppers and dresses for me:) I love Clay and Midnight in Glisten. The water theme just sounds so cool and I can't wait to feel it! My favorite color combinations are blue and white. These colors would be perfect for a quilt for my bedroom. I did the Rock Candy and now want to get the fabrics and pattern to do Chopsticks. I have always wanted to try Chopsticks. You make it look so good! I am crazy about the Seaside table runner. I would lengthen it enough to make it a bed runner for my king sized bed...so lovely! I think it would make a great bag…such a beautiful collection. Thanks for the chance at the giveaway! One project I'm inspired to make with Cascade fabric is a twin size quilt for my son. Gorgeous fabric. I think I would make some kind of bag. 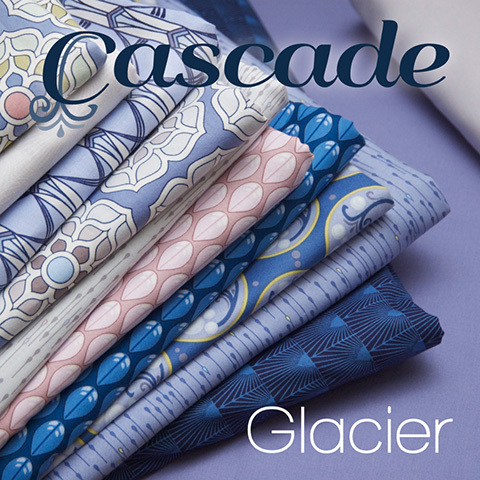 I love the Cascade line in Glacier, I would love to make a quilt for my home in these fabrics. Living near the ocean in winter makes me want to work with these colors, perhaps using the Hex n more ruler! Just got that and anxious to get to using it soon! I think one of the plus (+) guilt's would look great! I think I'd make a table runner too with Cascade! I love both groups, but especially the Cascade. I think it would make up beautifully in the Star patterns based on knitting patterns from Soma at Whims and Fancies. They would also look good in a Lone Star or Dahlia quilt. Love both color ways. I would make a zigzag quilt. This fabric will be perfect for it. Thanks for the opportunity to possibly win this bundle. Also want to Rey chopsticks. Really like it. Beautiful fabric. Got my fingers crossed. Tell Mr Random Number generator he is a handsome dude and to choose my number. Thanks. I'd love to make a set of pillows for my porch with this beautiful fabric. Thanks for introducing it! I would love love love to make Delight with this collection!!!! Your "Come What May" pattern is one I've been saving for just the right fabric for a blue quilt for my new daughter-in-law. The blues in the Cascade line are gorgeous! I like the glacier color. I just bought your toes in the sand. Looks fun. I'd love to make a Chopsticks quilt, lovely line! I'd make a mini quilt or two. This fabric would be perfect for a lap quilt for my living room. The colors are great. Lovely fabric! I think I would choose some for a new bag. Another Chopsticks would also be great. I've made one and it serves as a lovely headboard in our guest room. Beautiful fabric, beautiful projects. I think that I would like to make Toes in the Sand with the Cascade collection. Thanks for sharing and offering a giveaway. Love the subtle colors of Cascade! Sparkle Punch or Wonky Crosses comes to mind to showcase the larger prints but also how all the colors work so beautifully together! Thanks for this awesome opportunity to win Cascade! I've been dying to make one of your Giggles quilts. These pretty Cascade fabrics would make a gorgeous Giggles! 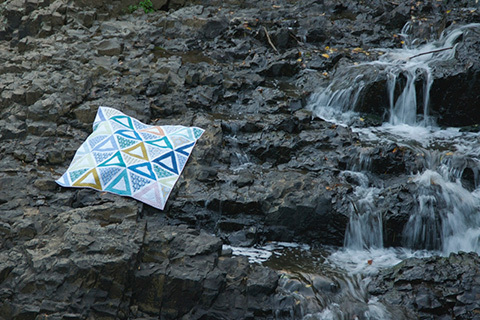 The Chopstick quilt is simply stunning in the Cascade. I would make that one. This fabric is really beautiful. It does look like waves so I am seeing a Bargello or a curve quilt. I really like your table runner and would make a table runner with the fabric if I win it. Love the patterns in the fabrics and the colours. What beautiful fabrics! Cascade is just gorgeous! I would love to make a table runner with star blocks. Thank you and Windham Fabrics for a super giveaway and a chance to win. Wow, I really love that chopsticks quilt! If I were to win I would definately make that. You know what? I am going to make it anyway, one way or the other! I would love to make a Seaside table runner with this fabric! So lovely!! Such fabulous colour mixes, that Glacier selection is stunning, but am placing both selections on my wish list! 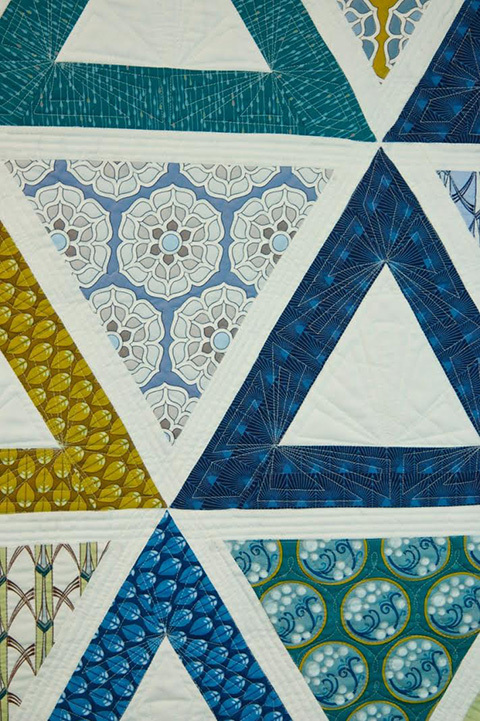 Ive never made up anything with triangles, so think Id like to try them and I adore the fine quilting around the triangles shown above! Live the chopsticks quilt out of the cascades...very calming. I would love to make Rock Candy. It would look gorgeous on my round table! I really like the fabric design that looks like rain with raindrops. I think I would need to make a modern quilt design that uses large pieces of fabric: looking at the fabric, I think I would have a hard time cutting it into little pieces - it's too pretty! I would love to make a Chopsticks quilt with the Cascade fabrics. I really like how yours looks. jaybird is my latest addiction. Now I'm going to be on the search for this fabric in Australia. May just have to do some on,ine shopping instead. 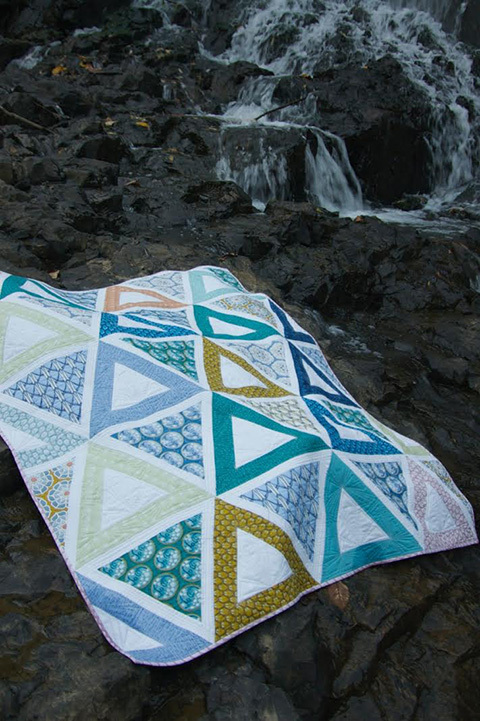 I make a lot of quilts for Project Linus and think the pond colorway would make a wonderfully cheerful quilt for them! Thanks! I love the cascade collection. I would love to make your chopstick quilt! Love the table runner - the work is so detailed and beautiful. Love this line. Thanks. So pretty! I would make some pieced pillows for my new living room. I love the darker colours in this collection, I'd use them to make a bag! The Glacier is lovely!!!! Would make a super table runner. Thanks for the chance to win. Ooohhhh, pretty colors!!! I've been wanting to make a pinwheel quilt, or a wonky star, I think this fabric would be perfect!!! Thanks for the opportunity. What gorgeous fabrics! I'd love to make a table runner. I think I would like to do some kind of a log cabin quilt, with different widths of logs to give a curved effect. I really like both of the groups of fabrics. These beautiful blenders would be dreamy in a busy pattern - they would tie it all together. Something with lots of movement...I'd have to sit with them a while to say for sure! I'd love to make a 'Chopsticks' quilt!! These prints are so peaceful. Makes a lovely quilt. I love the cool, water colors in Cascade. This quilt is another winner! 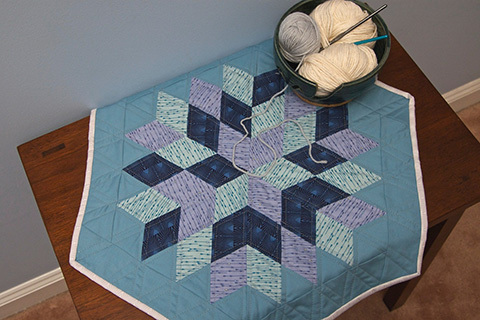 I would love to make a giant star quilt for a wallhanging. I think this fabric is perfect for the Seaside project but I would convert it to a quilt. I use quilts much more often than table runners. I would love to make my sister pillows for her cabin at the lake. I would like to try making that table runner. I really like the look. Thanks for the opportunity to win! I collect fabric like this and dream of making me a Huge Quilt or bedspread, but right now I want to make my granddaughters the cricket dress I just saw on Hawthorn Threads. Oh goodness, I love the fabric! The Chopsticks quilt is beautiful, I just got the pattern yesterday in the mail and this is perfect! I love the Seaside runner too. I'd make suare in a square style to show off all the beautiful fabric! I love that table runner! I am looking for some fabrics to make one and this line would be great for it! 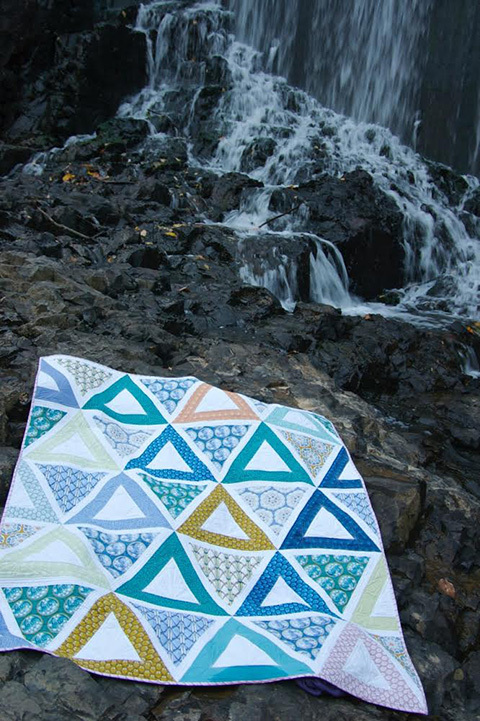 Cascade is really lovely, I think I could make a really sophisticated baby quilt with this. Fabulous collection. I'd like to make either Night Sky or Day Break with it.......I just can't decide which! Beautiful fabric and quilts! I would also make a quilt. Thanks for the chance to win. I am thinking a rock candy tabletopper would look great! I love the fabric, very inspiring and right off I can't help but think of making an art quilt with it. It would be so beautiful doing a nature scene involving a lot of water. Your talent is inspiring! Thank you for showing us so many ideas! Wonder how Cascade fabric would like in Northern Lights? I think I'd like to try and see how it turns out. I would love to make a chopstick quilt with this fabric line. I love that fabric. It is beautiful in the chopsticks pattern. I am just finishing up Toes In the Sand. This would be next. I'd make a quilt and matching throw pillows for my living roon. I have NO color in there! I think the Sunburst pattern from Dear Stella would look great in Cascade. 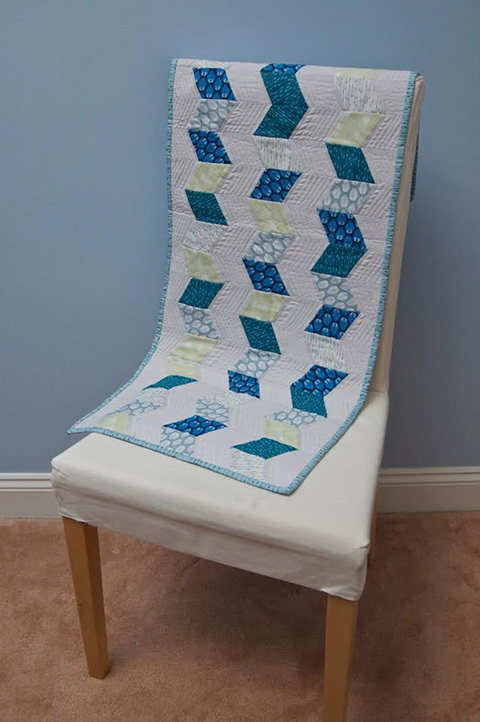 I do love the blues in Cascade and have been thinking of making another Anchor quilt, this would be a perfect addition. The Glacier colors would make a great, wintery snowball quilt. Simple enough to show off the fabric and soothing color scheme. I am really crushing on Toes in the Sand and I think it would be beautiful in Cascade. 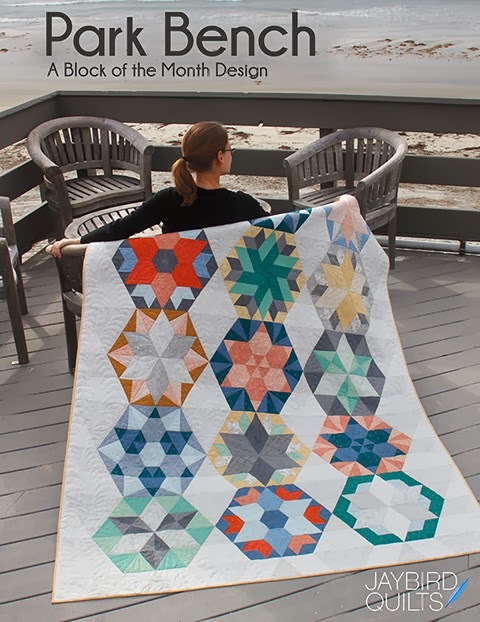 Love that Chopsticks quilt in these colors! Lovely fabric. I am finishing a Chopsticks quilt right now. Love the pattern. 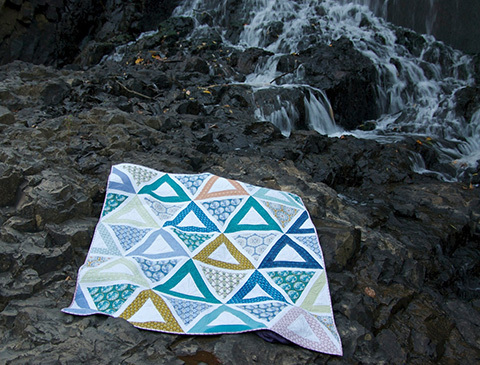 An equilateral triangle quilt would showcase this fabric very well! 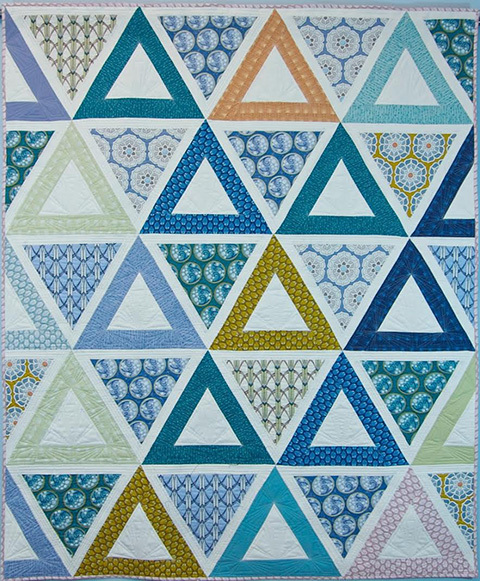 i really like the Chopsticks pattern and have wanted to make a triangle quilt for awhile - this would be great in Cascade! Would make a wonderful quilt for my son! Thanks for the opportunity! I'd love to try on the chopstick quilt! Such gorgeous colors and designs. My nephew is the Navy and my daughter is decorating our den in honor of his service, so pillows out of this would be perfect!